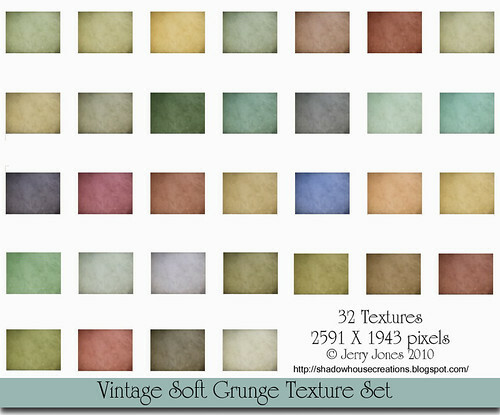 Vintage Soft Grunge Texture Set, originally uploaded by SkeletalMess. used as a vintage tint to your images. The set is divided into 3 zip sets, due to the large files and and quicker downloads. These are absolutely stunning...so beautiful! Many thanks Jerry! Thank You!! I can't wait to try every one of these out! What a beautiful set of textures. Thank you for sharing. These look stunning. Can't wait to download and try them out . . . Thank you so much! Lovely set! Thank you, Jerry! Thank you so much for sharing these wonderful sets! Just starting using textures & am loving them!! Absolutely gorgeous! Thank you so much for sharing.. These are wonderful! Thank you very much! Thank you so much for this Freebie. I want to let you know that I posted a link to your blog in CBH Digital Scrapbooking Freebies, under the Page 11 post on Feb. 02, 2010. Thanks again. You are amazing! Thanks for sharing your textures. Thank you! Love all the work you do and is very much appreciated! Thank you so much for sharing so many wonderful textures! Anonymous took the words right out of my mouth...you are so generous. Thank you. I am such a fan of yours. Thank you for sharing your talent and creativity with us! These are lovely. Can't wait to use them. Thanks for sharing. These are 3 great collections. Thank you for your generosity. would love to say thanks for 4shared wont let me download, gets jammed at 33%. sorry your links aren't working. But thank you for all your other wonderful stuff, I love your work, hope these get worked out. Ooo thank you very, very much for these wonderful textures!!! They are fantastic!!! It's so fun trying out your textures!! I came across your site today and just wanted to say how generous I think you are for offering these for free. I can't wait to try out all these beautiful textures. Thanks again! These are great. You are so generous to share your talents with us. Beautiful! Like all your textures and work! So happy to hear that you will continue with your sharing -- it is such an inspiration and even if we can't make them ourselves, at least your work helps ours to look better, and thus gives us great pleasure! You are so generous to share these textures (and all your textures). I use your textures tons and tons. Thank you! Could you make a link button for people to link to your blog? Thank-you for this big set! I recently discovered your blog through the CoffeeShop blog, and I'm so impressed at the quality of your work and the fact that you generously share it for free. Please know your work is very appreciated! Gorgeous set. Thank you so much! Thank you, I used the pink texture (V24b) out of this texture group. Seen within this portrait. wow, these are great! thanks for sharing! Just found your blog and am new to textures! I downloaded a few and am so very excited to use them. Thank you for sharing! Thank you for your beautiful work and generosity! I have been resistant to using textures because "everybody's doing it," but have need of them for a project and am thrilled to have discovered your site! Now I'm excited about diving into new treatments. What you give away is absolutely exquisite. Thank you very much! Thanks! I can't wait to use them. Such talent and artisitry you have. Thank you for sharing with us. I spent a couple of hours looking at your photos and all I can say is WOW!! Thanks so much for these wonderful textures !!! cant wait to try them !!! This morning started out with a bit of sadness in the creative software matrix....but now my life is full of gifts and presents! Thank you for making my afternoon fun! Beautiful set, thanks so much for sharing them! supremely awesome! Thank you so much for providing those in cyberspace!! Very generous indeed! Just discovered your site. WoW! can't wait to use these Fabulous tools. I'm especially into Masks, textures.